Read pages 471-473 in the Handbook of Nature Study (Lesson 121). These links will guide you to whether you have Dutchman’s Breeches or squirrel corn in your area. Make sure to view the images in this book to know what Dutchman’s breeches and squirrel corn. See what these flowers look like by viewing some YouTube videos featuring Dutchman’s Breeches: Information and Bee Foraging in the Dutchman’s Breeches. Here is another YouTube video that shows lots of early spring wildflowers including Dutchman’s breeches and squirrel corn. This blog entry has some amazing images of squirrel corn: Squirrel Corn. Use your outdoor time this week to look for early spring wildflowers, especially the two we are studying in this challenge. Make sure you have a good idea of what you are looking for and the differences between the two flowers (noting the differences in color, shape, and fragrance). Take along your art supplies and capture a flower in your nature journal while still outdoors. This is a great way to encourage careful observation. Be sure to include a description of the habitat that you find your wildflower growing. Advanced study: For each flower, draw the leaf and flower carefully and use some of the suggested observations in the Handbook of Nature Study lesson to make a more careful study of the flower’s parts. 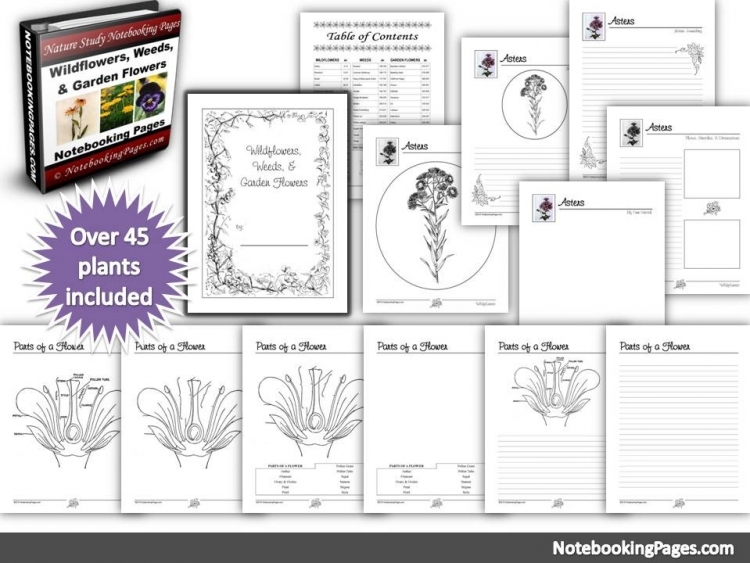 Create a nature journal entry for your wildflower if you haven’t done so already. There is a notebook page for each flower in the ebook along with a more general early spring wildflower page if you need to use it instead. Use this link to learn some of the additional common names of these two flowers: Hiker’s Notebook. Advanced study: Create a list of the similarities and differences between the two plants under study this week. Make sure you can distinguish between each plant even if there are no flowers blooming. You can use the notebook page included in the ebook of you wish.